1. Lam P. New horizons…developing tai chi for health care. Journal of Australian Family Physician. 1998 Jan-Feb;27(1-2):100-1. 2. Lam, P. (2004). “Tai Chi for ageing and its associated chronic conditions.” Journal of Aging and Physical Activity 12(3): 347-347. 3. 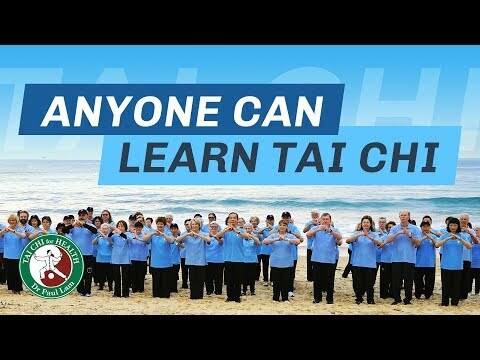 Song, Lee E, Lam P, Bae S. Effects of Tai Chi exercise on pain, balance, muscle strength, and physical functioning in older women with osteoarthritis: A randomized clinical trial. Journal of Rheumatology. Sept 2003. 30:9 page 2039-2044. 7. Fransen M, Nairn L, Winstanley J, Lam P, Edmonds J. A Randomized Control Trial Of 200 Subjects Comparing Tai Chi, Hydrotherapy And Control, To Measure Improvement In Pain, Physical Function, Muscular Strength And Walking Capacity. Arthritis Care and Research.. Vol.57, No.3, April 15, 2007, pp407-414. 12. Song, R., Lee, E. O., Lam, P., & Bae. S. C. (2007). Effects of a Sun-style Tai Chi exercise on arthritic symptoms, motivation and the performance of health behaviors in women with osteoarthritis. Journal of Korean Academy of Nursing (English), 37(2), 249-256. 13. Song, R. Lee, E. O., Bae, S. C., Ahn, Y. H., Paul Lam, Lee, I. O. (2007). Effects of Tai Chi Self-help program on glucose control, cardiovascular risks, and quality of life in type II diabetic patients. Journal of Muscle and Joint Health, 14(1), 13-25. 18. Song, R., Lee, E. O., Lam, P., Bae, S. C. (2009). Effects of Tai Chi or Self-help Program on Balance, Flexibility, Oxygen Consumption, and Muscle Strength in Women with Osteoarthritis. Journal of Korean Academy of Fundamental Nursing, 16(1), 30-38. 19. Song, R., Eom, A., Lee, E. O., Lam, P․ & Bae, S-C. (2009). Effects of Tai Chi combined with Self-help Program on Arthritic Symptoms and Fear of Falling in Women with Osteoarthritis. Journal of Muscle and Joint Health, 16(1), 46-54. 20. Amanda M Hall, Chris G Maher, Jane Latimer, Manuela L Ferreira and Paul Lam. A randomized controlled trial of tai chi for long-term low back pain (TAI CHI): Study rationale, design, and methods. BMC Musculoskeletal Disorders 2009, 10:55 (28 May 2009). 21. Rhayun Song, Sukhee Ahn, Beverly L Roberts, Eun Ok Lee, and You Hern Ahn. Adhering to a Tai Chi program to improve glucose control and quality of life for individuals with type 2 diabetes. Journal of Alternative and Complementary Medicine, 15(6), 2009, 627-632. 24. Michelle DiGiacomo, Paul Lam, Beverly L. Roberts, Tang Ching Lau, Rhayun Song, Patricia M. Davidson. Exploring the Reasons for Adherence to T’ai Chi Practice. The Journal of Alternative and Complementary Medicine. December 2010, 16(12): 1245-1246. 26. Hyung Kyoung Oh, Sukhee Ahn, Rhayun Song. Comparing effects of Tai Chi exercise on pain, activities of daily living, and fear of falling in women with Osteoarthritis and Rheumatoid arthritis. Journal of Muscle and Joint Health, 18(2), 2011, 137-146. 27. Hua Ren,Veronica Collins, Sandy J. Clarke, Jin-Song Han, Paul Lam, Fiona Clay, Lara M.Williamson, K. H. Andy Choo. Epigenetic Changes in Response to Tai Chi Practice: A Pilot Investigation of DNA Methylation Marks. Evidence-Based Complementary and Alternative Medicine, Volume March 2012, Article ID 841810, 9 pages. 28. Sukhee Ahn, Rhayun Song. Effects of Tai Chi exercise on glucose control, neuropathy scores, balance, and quality of life in patients with Type 2 diabetes and Neuropathy. Journal of Alternative and Complementary Medicine, 18(12), 2012, 1172-1178. 29. Rhayun Song, Moonkyoung Park, Jin Ok Chung, Jae Hyung Park, In Whan Sung. Effects of Tai chi exercises on Cardiovascular Risks, Recurrence Risk, and Quality of life in Patients with coronary artery disease. Korean Journal of Adult Nursing, 25(5), 2013, 516-527. 31. Moonkyoung Park, Rhayun Song. Effects of Tai Chi on fall risk factors: a Meta analysis. Journal of Korean Academic Nursing, 43(3), 2013, 341-351. 33. Beverly Roberts, Rhayun Song, Sukhee Ahn, Paul Lam. Research Metholodogies for Tai Chi research. Edited by mark langweiler, Research methodology for Complementary and alternative therapy. 2015. 34. Rhayun Song, Sukhee Ahn, Heeyoung So, Eun-hyun Lee, Younghae Chung, Moonkyoung Park. Effects of Tai Chi on balance: A population based meta analysis, The Journal of Alternative and Complementary Medicine 21(3) 2015, 141-151.